The centre can be hired for children’s parties, Christenings, baby showers and many other types of gatherings. Our children’s room and community room is ideal for groups of up to 15-20. Maximum 25 children with accompanying adults for centre hire. We have a room set up for children’s use and a room for baby use. A room is set up with children’s and adults tables and chairs named the ‘Community Room with adjoining kitchen and a small meeting room. The rooms are free flowing into each other so children and adults can disperse throughout the centre. All rooms are bright and airy with windows and natural light. £75 whole centre exclusive use for a party of up to 2 hours with an hour either side for set up and clearing away (total 4 hours). Either evenings or 10-2 or 2-6 Saturdays and Sundays. A refundable deposit of £50 is required in cash/cheque on the day of hire. This will be refunded after your party as long as nothing is damaged and the centre has been tidied, cleaned and returned to its original state. If you wish to make a booking please email booksparkburntwood@outlook.com where we will be able to check for availability and then take your booking. Please read the terms and conditions of booking before hire. On the day of hire you will be let into the centre by one of our volunteers. You will then be left to organise your party as you wish. Please follow our terms and conditions of booking. At the end of your hire the volunteer will return to lock up. Please remember parties are for birthday boy/girl aged 5 and under. 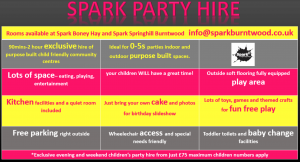 Children are the sole responsibility of parents and carers whilst at Spark. If you would like recommendations for party entertainers or caterers please enquire. We do not provide these directly ourselves.